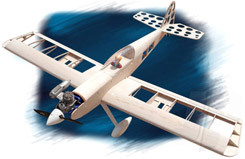 All Products > "5500004 Seagull Challenger Kit"
ARTF kits are great, we all love �em and we all appreciate the time savings they provide, however a growing number of R/C flyers are finding that, having assembled one or two ARTFs, what they really fancy is a stab at traditional building. Some choose a plan build for their first foray into balsa-bashing but most seek a simple kit, a kit such as the Seagull Challenger, that offers all the advantages of laser cut parts, carefully chosen hardware and an instruction manual that guides you step-by-step through the build process. In truth, the Challenger is the perfect choice for not only does it ensure a problem-free build, it offers an opportunity to produce a one-off model in a colour scheme of your choice and promises a fantastic, agile aerobatic flight performance when you�re finished. Building your own R/C model is absorbing, enjoyable and immensely satisfying and that�s why so many are deciding to give it a go. It�s also why the Challenger kit is such a popular choice amongst sport flyers and those seeking a good follow-on aerobat. • Suits i.c. or electric power. • Makes a perfect follow-on trainer. • Takes 4-channel radio with 5 servos. • Interlocking parts for easy assembly. • Two cowl options - choose balsa side cheeks or full moulded cowl. • Practical upright engine installation.